We have app development kits for both Apple and Android, open source and commercial software, tools for version control and agile project management. Our dual boot studio is the base camp for the course, this is a proper development environment with industry strength tools and software developments kits. You can, use OSX, Windows7 or Linux on the same machine and customise your account so that your preferred set up will be available whenever you log in. We also have a dedicated server and dedicated developer support with lightening speed turnaround for updates/installs and tweaks to support you. As this is a games focused course we have various specialist kit on hand to support student projects, develop for AR, VR, Leap Motion, Kinect, Occulus Rift, Google Glass and more. Games development students work alongside computer science and robotics students and can collaborate on interdisciplinary projects. Your course team are actively involved in apps development, Dr Nigel Barlow leads Android development across our computing courses and Dr Nicholas Outram runs iOS development courses all over the world. He also runs courses for local developers. Mr Martin Beck provides core programming and AI. Dr Dan Livingstone leads the Interactive Systems Studio, our in house development team who also contribute core workshops and deliver a lecture series to the course. In addition to the main studio, students have access to a wide range of resources across the Faculty of Science and Engineering, including electronics, robotics and related workshops to support for hardware based projects and interface prototyping. We also have a collection of novel interfaces, games controllers, consoles, arcade machines and drones to support innovation. Up-to-date laboratories equipped with specialist software such as Oracle, Visual Studio, Java, the Adobe Creative Suite. Specialist resources for games development and innovation in robotics. Laboratories offer free internet access and many are open out of hours. 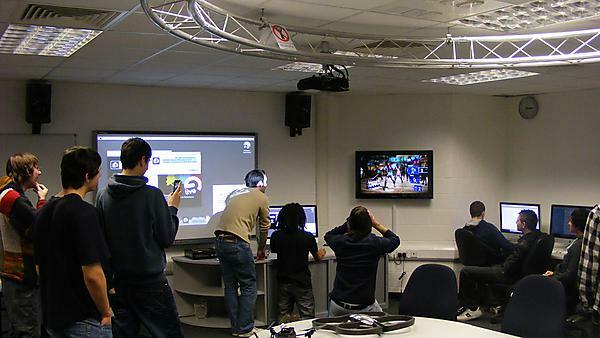 24/7 open access computing and media facilities. Wireless networking in many parts of the campus. This exciting initiative facilitates the learning process and enables lecturers and students to annotate texts and share their notes and views online. Ambler - Agile database techniques: effective strategies for the agile software developer. Farrell - Microsoft Visual C# - An introduction to Object-oriented Programming. Goodrich -Data Structures and Algorithms. Silberschatz - Operating System Concepts. Stephens - Beginning database design solutions. Tavani - Ethics and Technology: Controversies, Questions, and Strategies for Ethical Computing. Watson, Nagel, Pedersen & Reid - Beginning Visual C#. These eBooks are readable using Vitalsource Bookshelf, available for Windows, Mac OS X and for iOS (iPhone, iPod Touch and iPad) or Android devices (please check the Vitalsource website for full system requirements). There is also a Bookshelf Online portal that allows access through most devices that have a web browser. Please see the Vitalsource web site for further information.